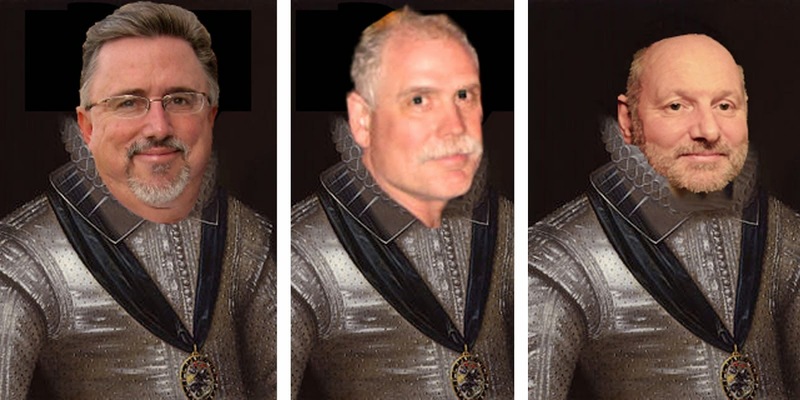 Knights of Creativity Spirit & Ale: Part 2 - Mystic Journey to the Land of Moors...and Knights of the Templar! 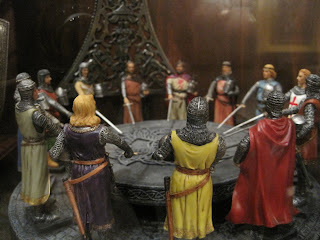 Part 2 - Mystic Journey to the Land of Moors...and Knights of the Templar! 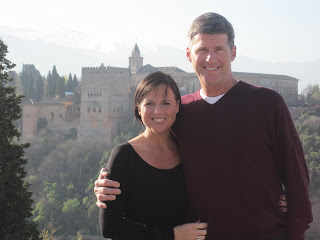 As mentioned in my earlier blog this week....Lady Traci and I had the great fortune during our visit to Spain to be taken by her daughter Lady Brittany and her gallant Spanish knight Sir Roberto of Murcia to the beautiful and medieval city of Granada. 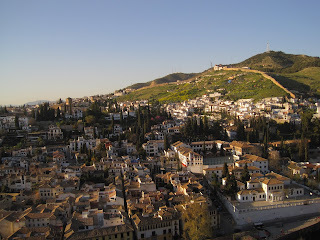 Granada is set in the southern highlands of Spain, nestled against the foot of the Sierra Mountains. Sitting high about the city is a fabulous fortress called The Alhambra (in the background behind Lady Traci and myself ). The Alhambra is the lasting symbol of the Nasrid kingdom which ruled over Granada and the last symbol of of Muslim power in the Iberian Peninsula we now call Spain today. 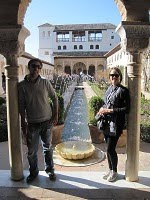 The Alhambra was built and rebuilt as a series of castles and fortresses by the Moors from the 700-800 AD period until 1232 AD when Muhammad ibn Yusf ibn Nasr took power as the Sultan and made the Alhambra into his private palace and source of power. The Moors ruled Granada (23 sultans in all) for over 254 years until the Christian armies drove them out. 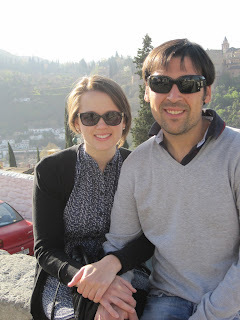 The Christians retook the Alhambra (without a fight I might add!) in 1492 and continued to add structures on the mountain top. Today...the site hosts over 6 million visitors a year....and Lady Brittany informed us you have to make reservations for your visit weeks in advance if you hope to gain access to the site on the day you desire!! 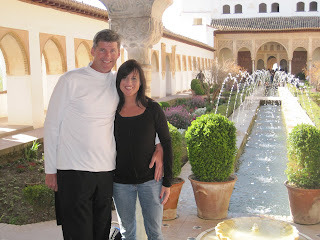 We loved walking through all the courtyards.....castles.....and gorgeous artwork that adorned the walls all around the Alhambra. 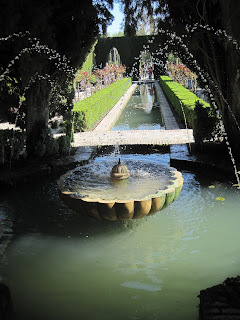 There are acres of beautiful, well-kept gardens and fountains and pools throughout the site. It also helped that the day we visited was a beautiful sunny 22 deg C! At days end.....Sir Roberto wanted to take us for a real treat: to a tavern that had a Knights of the Templar theme (as the Knights flourished in this area of Spain during the 12th and 13th centuries. We soon found ourselves in the El Antiquidor....and also available to a vast array of brews from around the world. Sir Richard thought...."Surely this must be a view of heaven!" Sir Roberto and I had a duel of tapas plates that night at El Antiquidor...and I was finally able to get Sir Roberto to yield to that 6th plate of fancy toasted tuna sandwiches. Sir Richard lost track of how many Alhambra Negrils (remember...Alhambra beer is brewed in Granada!) and Guinness he had that night. Good thing we had our lovely Ladys with us to guide us back to the Hotel Carmen that evening. Sir Richard, Lady Traci, Sir Roberto and Lady Brittany had a wonderful two and half days visiting Granada during our visit to Spain. This Knight would HIGHLY advise you plan a visit to Granada if you are planning a future visit to southern Spain....and the ancient land once roamed by Moorish warriors and gallant Knights of the Templar. Its quite interesting to note....that history of this area shows.....that the Moors pre-1200AD were fairly tolerant of other religions and nationalities in this region. It was the Christians in the late 1400s who decided it was time to put all of Spain under Christian rule....and they took control of southern Spain and drove the Moors back across the straits of Gibraltor. There are still many remnants of the Moors influence in southern Spain...and none more so than in Granada. 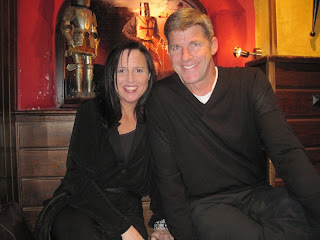 Lady Traci and I do hope to make another visit to Spain in the future.....and we also hope to visit some other cities (ie; Seville, Cordoba) we did not get to this trip. Adios!!! Sir Richard Lionheart.....who left his heart in Granada! Another excellent Spanish recap! The Alhambra is one of those cross cultural gems, like the Dome of the Rock in Jerusalem. The pre Spanish dynastic history of coexistence between the Moorish and Spanish cultures is an example of how things could and should be. I pray that today's Muslims and Christians of the world can find a way to find that spirit of coexistence, which breeds creative thinking and living. The Knights Templar, basically the western version of Warrior Monks, did a lot in making sure that the Conservative Christian agenda (ie: quest for political and economic power) flourished and that there would be no coexistence with other cultures. Today the Muslim Jihadist fulfill that role in Conservative Islamic society. 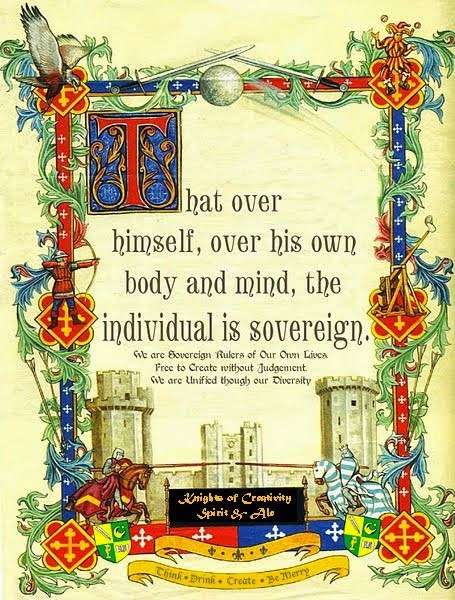 Moderation and toleration should be the mantras of today's society...and the Knights of Moleskine, Spirit and Ale are sworn to uphold and protect this ideal! Here...here....Sir Hook! Well stated and timely your response. I raise a tall frosty glass of Alhambra beer to you....and to all Knights...no matter their affiliation nor what flag they fly under. I have an awesome table book on the history of the Alhambra with some beautiful pics....if any of you ever want to borrow it. I would also suggest anyone who has not seen the movie Kingdom of Heaven....should rent that movie...which does a fair job of showing how Muslims and Christians used to co-exist...before conservative forces on both sides created basis for the Holy Wars. Let's hope somehow we CAN all learn from history...and not repeat ourselves. The advent of the suicide bomber/martyr is changing the whole playing field of how radical Islam and the Christian Western world interact and conflict with each other. My prayer....is that somehow....there is a return to the belief that all life is sacred....for both sides of the conflict....before there is a chance for future resolution. Sir Richard Lionheart....I'm a lover....not a fighter! Agreed! I have an idea...we need to get together and cook up some Tapas, have Spanish wine and beer and check out your books and photos soon!